Haa doesn’t have a Dzong, Lhakhang Karpo is still on the ground, Prime Minister is from Haa, Foreign Minister is in the court, and wrathful Ap Chundu is still merciful. Who cares about a Dzongda using Dzongkhag DCM for private purpose, in fact we always thought higher officials could do that because they have always done that. Lynpo Rinzin Dorji should just stop lying and face the consequences because everybody knows he is lying about the ‘emergency’ and playing with words in the law book to suit him. Though it's for the court of law to decide how serious it is. I am more disappointed that one of the holiest Lhakhang in the country is torn down with a promise of better future but became a playground of corruption and left in that pathetic state for ages under his leadership. And I am dismayed that he had been busy transporting his ten truckloads of timber in emergency while his efficient leadership could have given the Lhakhang a glorious reconstruction it deserved. Question also has to be asked about how so much timber could be taken from Haa by one person. Haa has become a timber heaven, legally or illegally. Timbers are transported away during the day and smuggled during the night. Once a thick forest above my village now looks like a park with few trees. Water sources are drying up and people think the time has come, they don’t know it’s because the trees are gone. We Haaps also enjoy a certain annual income called “Khapsang Paysha” Which translates to ‘Profit Money’. It comes from the IMTART for all the trees they have taken from our Dzongkhag in a year. When I was a child, I remember receiving Nu.512 as Khapsang Paysha, which was huge those days. So there go our trees. What are trees when people won’t even spare the revered abode of gods and deities. Lhakhang Karpo is more than just an ordinary temple for people of Haa, where we don’t have a Dzong. 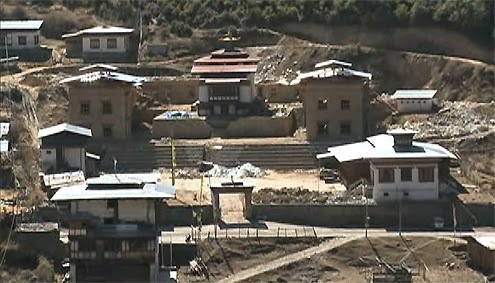 Haa Tshechu is performed there and now it has been a messed up construction site. It’s emotionally damaging. Lhakhang Karpo is also considered the abode of the mighty Ap Chundu and I don’t know how he allowed all this to happen. This seemed to have taken its toll on the monks too. It’s rather easier to look for snow leopards on the mountains than to get one monk from Lhakhang Karpo to perform rituals. If by luck or connections you get a few monks in the morning consider yourself the luckiest if they don’t abscond by midday. What type of monks practices such rowdy livelihood? One thing leads to another and nothing good seems to be happening in and around Lhakhang Karpo. It’s supposed to be a national heritage and not a newspaper headlines every week for all the wrong reasons. Therefore, I pray to Ap Chundu, the mighty protector of the nation to unleash his wrath and settle everything in his way. This is sad, happening with all the mightiest in one place.